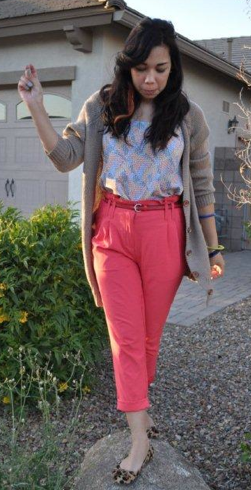 As previous stated I'm loving bright colors, colored pants and anything that pops. I usually match these reddish/coral pants with a simple top, but I thought I would change it up this weekend and mix and match prints. These Kimchi Blue Paper Bag Trousers are so comfortable and that's just the thing I was seeking. These cheetah flats are my go to shoes. I think cheetah matches with anything simple. Why not?! On Saturday I checked out our local fair, actually it was a festival the Ostrich Festival to be exact ( how cute is that name). My inner child was uber excited to have some good ol' fair food and play some games! The sun was setting and the temperature was dropping so I paired this look with an oversized cardigan - I love the oversized pockets and big buttons.